Also the orientation of the pairs is important. In a stack, a G-C pair is not (generally) equivalent to a C-G pair. My strategy for solving the EteRNA challenge puzzles is as follows. This strategy should work for puzzles of all difficulty levels. Fill all stacks with AU pairs of random lengths of 1-3. There are several things to be aware of when doing this to pay attention to that will be discussed later in the advanced strategies section below. Replace AU pairs with GC pairs as needed to stabilize structure into desired shape. Use as many as needed to stabilize it REGARDLESS of the number of allowed GC pairs. Once the structure is stabilized, go through the GC pairs and remove as many as needed to get under the number (if applicable). This is generally the hardest part in the more difficult levels. One good and quick way to start is to change each of the GC pairs to GU pairs and see if it maintains the structure. This will quickly remove some of the extra GC pairs that were placed earlier. Next, if you still need to reduce the number of GC bonds, what you can try is to change the GC pairs to AU pairs, which are the next strongest bonds. Be sure to try the AU pair in both orientation (i.e. AU and UA) because they are not always of equal strength. Start on one end of the molecule (or anywhere, it doesn't matter) and change the A of EVERY AU pair into a G. Check to see if the structure is still in the target shape (ring around structure icon stays white). If it maintains the structure, keep it and move on. If not, undo (press Z key) and move on. When placing the AU pairs in Step 1, there is several things to consider. Is generally not stable, where N stands for any nucleotide (although it is possible to stabilize it by changing the flanking nucleotides (N here)). Putting two GC pairs in the stack is not sufficient to keep the loop closed. So the way to keep it closed is by modifying the nucleotides adjacent to the stack in the loops. For example, in the Saccharomyces Cerevisiae puzzle, putting two G's in positions adjacent to the loop, stabilizes the stack and keeps the loop closed. This sort of technique is also applicable to other types of loops as well. If you are having problems getting loops to close, try changing some of the nucleotides in the loop to G and see if it helps the free energy. Thank you for taking the time to write this guide! I use exactly the same strategy - developed by trial and error. It would be good if we could see our solution after the fantastic winning display is finished. I often can't remember exactly what I've done to win. Thank you! Now that the puzzles do let you do this, I wouldn't want to live without it. This is great -- and it also prompted an interesting conversation on chat about how to make more difficult puzzles. It would also be great if others posted their own strategies below! Well the puzzles are too easy once you get the hang of it. although I'm brand new (only playing a few hours), I already want to voice a STRONG second to mummiebrain's idea above (" It would be good if we could see our solution after the fantastic winning display is finished. I often can't remember exactly what I've done to win.") - I also would love to be able to study the finished configuration. Also, kudo's to Matt B. for the strategy guide. I believe that this is being worked on. And thank you. We updated the game so that you can "Stay" after you clear a puzzle. There you'll be able to play with your cleared solution. But after you left a cleared puzzle there is no way to see your cleared solution again, or is it? I like to go back to my solution and then try to tweak it to get a lower energy number. Basically the solution works but after I have something that works I want a chance to optimize it before submitting it. Granted I'm only doing the puzzle challenges at the moment. I figured I need to get a lot of practice there before trying one of the labs. @Madde: Oop, you were correct, Madde, and I was wrong. After clearing (or it may be after session), it does seem to be gone for good, This is a shame, I wish our solutions were cached locally for our study later if we want them; sometimes I wish I could go back and look at a certain puzzle for a certain question I have in mind, and it is more often not right after I complete the puzzle, but much later. Unfortunately, I now see, that later is not an option. While solving puzzles, you might have encountered Unpaired Bases as shown below. 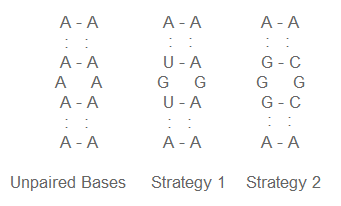 You can use strategy 1 or strategy 2 to fold an RNA into target mode. This is a key point, sneh! Many thanks for stating it in such an explicit, focused - and illustrated - manner - This broke me through in several puzzles that were giving me a tough way to go. In fact, we are planning to study and formalize player strategies to test them against existing algorithms for RNA design. However, mbp21's awesome strategy does not mean that it's time for EteRNA to pull up stakes yet! The heart of EteRNA is The Lab, where player designs are scored based on real experimental synthesis and validation. Mbp21's strategy, as great as it is, will likely not always yield RNAs which synthesize properly. If not, we must hypothesize new criteria for successful synthesis, and develop new strategies which satisfy these criteria. There has never been a game quite like EteRNA before. It's going to be an exciting ride, and we're just beginning! Ryan. The energy situation is somewhat intricate. Energy depends on two things: sequence and conformation (a.k.a. shape). A basic biochemical assumption is that Nature always finds the minimum energy conformation for any sequence. Indeed, because of the relative simple rules of RNA self-assembly, EteRNA automatically solves for the "best" (minimum energy) conformation for any sequence you make. (Or at least, the best conformation given EteRNA's simple energetics model.) Therefore, just because one sequence has a lower energy in EteRNA (higher negative kJ) doesn't necessarily mean that it's better than another sequence with a higher energy, since both conformations are energy minimal with respect to their sequences. One of the things which we'd like to figure out through the lab is if lower energy really is globally better, i.e. more likely to form in nature. The new tools that became available today are really useful for developing new strategies, or improving upon existing ones. For example, now it's easier to fill stacks with either A or U, and then tweak them using the "Pair swapping" brush. This is specially useful in the Brassica napus puzzles, where you can start by changing one of the chain sides to U, and then start swapping them from top to bottom, trying to get as many white areas as possible in the puzzle thumbnail. After that, strategy is the same as in the original post. Also, when a puzzle requires a lot of G-U pairs, you can try swapping as many A-U pairs as you can without losing the target shape, then replacing A with U. As Matt Baumgartner mentioned in his excellent tutorial (above), Step 3 (removing as many G-C pairs as possible) "...is generally the hardest part in the more difficult levels." Matt's further explanations on HOW to do this are sufficient in themselves to get you well on the way to conquering every single puzzle in EteRNA, regardless of level. 1) If you are having an especially difficult time on one puzzle or on one stack in a puzzle, instead of starting over, try simply "re-seeding" the one difficult stack with a different random scattering of Uracils. This is easier and faster than a full re-start, and is often sufficient to get you rolling again. 2) A trick to get rid of a stubborn G-C pair that will often work is to move the Cytosine to the other end of the stack; Often, in a stack with a Cytosine on one end, it seems to make little difference which end the Cytosine lives on, and the opposite end may have a better loop for placing adjacent "Guanine Hooks," (as I've come to call them). Once you successfully move the target Cytosine to the other end of the stack, you can resume your normal routine of solving, and many times, it will now work on the new end where it had failed before on the original end. 3) I strongly suggest developing the habit of using the the "tagging" feature (Ctrl-Click on a base) to mark the Cytosine you are trying to eliminate - this will save you endless grief by helping you not lose your place when glancing elsewhere, or losing your focus for a split-second, or when returning after an interruption. Starting with the pair just beyond your marked "target" Cytosine, swap pair 1, then z-out, pair2, z-out... pair n, z-out, etc. in binary progression, i.e. : in a 4 pair stack: Flip sequentially by itself /themselves, first pair 1, then pair 2, then pair 3, then pair 4, then flip together pairs 1&2, 1&3, 1&4, 2&3, 2&4, and 3&4; then, 1&2&3, 1&2&4, 1&3&4, then 2&3&4, and finally 1&2&3&4. Rarely will you have to go all the way through such a progression to reach a success, so it is not perhaps as daunting as it may seem at first glance - the results will convince you of the worth of it. .....a) Sometimes it is not the first adjacent Adenine that is the key for substituting with a Guanine in order to eliminate your target Cytosine. .....b) First, it may not be a single adjacent at all, but a pair of adjacents on opposite sides of the stack. .....c) Further, it may even be a triplet or quadruplet of adjacents oddly spaced in one loop or in loops on opposite ends of the stack, so it will help you if you are by nature patient and methodical in discovering these permutations. (This is another time when a binary progression of Guanine placements in the loops, similar to the binary progression of base-pair flips in the stack - will often yield a successful result). .....d) Finally, each permutation of base-pair flips in the stack will affect the results you achieve with "Guanine Hook" placements in the loops, so if one round of "G-Hook" placements fails, you will sometimes find it will still succeed if you try again after a different pair-flip in the stack. .....e) Surprisingly, sometimes "adjacent" Adenine in a loop might be more accuately described as first available Adenine even if not adjacent. This is especially true where multiple stacks meet a large loop right next to one another; the stack-ends seem to have a sort of "pass-through" effect, such that the first available Adenine after two or even three stack ends, can act just as if it was adjacent to the stack you are working on. This odd phenomenon has saved my bacon on multiple occasions. 6) Remember that every single change you make anywhere in the whole puzzle affects the interplay of energies in the entire puzzle - from end to end - so one sucessful Cytosine-to-Uracil conversion on one end of the puzzle, or even one simple base-pair flip - just may - break open the other far end of the puzzle where you may have thought you had exhausted all possibilities for progress. I suggest making it a habit to perform multiple passes to take advantage of this fact. ...where the string of 3 consecutive G's in Sneh's "Strategy 2" has been broken up in to two diagonal pairs of G's instead. I now find I use this third hexagonal variaton more often than either "Strategy 1" or "Strategy 2" from Sneh's post above, although, all three find uses regularly. 9) If all seems futile, go for a 30-minute walk, come back, and re-seed all your random Uracil placements. Somtimes the "luck of the draw" will advance you where otherwise dozens upon dozens of swaps would not even have been sufficient to find that winning combination. I've been trying to recall some of the other interesting little things I've noted over the past few weeks, (I know there are a few I'm forgetting), but they are just not coming to mind just now. I will add them later if and when they occur to me again. I hope at least one person finds at least one thing in this list that they can use to better their game. Wow, Dimension9. This is totally awesome. At some future point in the project, we hope to formalize these strategies as algorithms and then compete them head-to-head with existing algorithms in RNA design. Great compilation of startegies, very usefull ! I paint one side and all loops in red, with preference for outside. I paint the other side in blue. I put an AU at the crossing between every stack and loop with blue on the other side than the stack except for little symetrical loops in the middle of a stack. I put GC only at wierd angles. At this point, often most of the stacks are whites with problems in angles and loops. If a stack is not white, I put all it in the other side or I put an AU in the middle always in the reverse side , if it dont works at random. For loops, I put just the yellow needed to minimize energy never blue or green. 1. From the all-yellow initial state in target view, do a walk around the structure adding blue where ever there is an unpaired yellow. Do not bother making this intentionally random, just run blue bases up one side of every stack. 2. Next, examine the little image in the top left corner that shows a summary of your current solution where red indicates bad sections and white indicates good sections. 3. Using the Swap Bases tool (the 5 key), begin flipping yellow-blue pairs while watching the solution summary for the global impact of each flip. This is the phase I spend most of my time in. My goal is to get as much of the summary to the white state just by performing base flips with only yellow and blue bases. I think of this phase like lock-picking in reverse. Each time I flip a base, it's like adding another notch in a key that prevents it from fitting other parts of the puzzle. I'm trying to jigger the bases so that, for the most part, they cannot line up in any way other than the target solution. Little changes can have a big impact and it pays to experiment all around. 4. When I have ceased to make further progress with base-flipping, I toggle between target and natural mode. I note places that can only be fixed by adding red-green pairs. These are areas that line up properly in natural mode, but still lack the necessary bond strength to form the desired loops and bulges. I add the minimum number of red-green pairs necessary to lock down the structure. I don't add red-green pairs in areas that are already all white in the solution summary at the top. 5. If the puzzle has a minimum red-blue pair count, then I replace yellow bases in yellow-blue pairs with red in order to satisfy this requirement. Since these are the weakest bonds, one must avoid inserting too many of them in a row, lest the structure become too weak to hold together. Usually, I can get at least 2 in a row, sometimes 3. Note that this method starts by flooding the puzzle with intermediate bonds, then inserts the strongest bonds, and finishes by adding the weakest bonds. 6. For very tight loops that refuse to stay closed, I may add extra unpaired red bases, but this seems to be a rare occurrence in the puzzles. 7. There are also situations where it is only necessary to flip a red-green or yellow-blue pair to get everything settled, and it is worth the time to probe for these trivial solutions. Flipping pairs is a deceptively powerful way to tweak a structure, and it is also quite interactive since the operation is its own inverse (as long as you are in target mode, a second click will easily undo your change). I just used this strategy to solve a level 4 puzzle. It works. So, with minor differences, we have a pretty effective common algorithm. But then I don't really see the point of the game (he said, after spending ten hours playing with it!). On the one hand, if there were a point to hand-solving, I might ask for this or that additional feature. On the other hand, it would seem a modest program could churn out a dozen ranked solutions in a couple of seconds. In particular, it seems an AU painter feature would be nice, or even a better replacement for an all-A starting point. I suppose I also remain unclear what the point of the synthesis lab is, compared to the game. Yes the folding algorithm needs validation, but how does pattern X relate to whatever the physical validation reveals? FInally, my two cents to the algorithms, perhaps known to those trained in the field but new to me, was that swapping the AU pairs sometimes does make a difference, but the news is that most of the time it does not! That allows the easier painting of blues on the starting patterns and generally allows the random lengths of AU alignments to work. Clean Cut PATTERN guide to solving puzzles. After reading @korsen, "Pentagon shaped dot pairs will ALWAYS need to have two pairs of Red-Green, with the point/top dot of the Pentagon left Yellow. ", I reviewed my handful of Level 4 solutions. I found a few pentagons with GU and AU pairs matched with one GC pair and one where no GC pairs were required (try Xenopus tropicalis). It took more than one minute to solve these puzzles, but my goal was to push as high as possible in the level 4 competition rankings, assuming that gaining skill at placing difficult GU pairs would be rewarded in the lab design and synthesis phases (TBD). I've gleaned from some of the staff and more experienced player postings that while extreme designs may quickly solve a puzzle, they won't likely fold during synthesis (see "RNA Lab: "Christmas Trees," "Cub Scout Projects," and "Optical Illusions"). For me, having one of my designs gain high marks when synthesized would be the ultimate prize and of course the points would be nice too! I think I agree with Aviel Menter. I thought the whole point of this was to have people reinventing the wheel. I did inquire about calorie management, but I knew that I could go through a tedious trial and error that would get me to the same results. I enjoy thinking about the structure of uracil and the ways it makes RNA so different from DNA. I think that too much explicit guiding can prevent breakthroughs. Other strategy guides to puzzle solving have been made in the meantime and since they are not mentioned here, I thought I would add them. Also check my PROFILE. There I will have an updated list. Considering that the strand starts its fold from a perfectly straight orientation, the bases are going to be drawn to pairs very close on the stack, so start at the hairpins to setup the target shape, working towards the ends last. This algorithm assumes the strand starts with all A's. I suspect that this default for all the challenges is skewing the solutions. I'd love to see some variation of starting stack. This solution doesn't minimize energy, but DOES focus on achieving the desired shape with the strongest base pairs. Place G-C pairs at the neck of each hairpin, enough to start the strand folding the right way. Especially if you are limited on the number of G-C pairs allowed, this is the best mechanical use of these strongest pairs. Use up the allowed number of G-C pairs at the beginning of each new zipper. Continue the zippers with A-U pairs, the second strongest. When a zipper is interrupted by a loop, resulting in an angle, where the zipper resumes it probably needs a strong G-C pair up front to fold correctly, perhaps with the addition of the side G. If the fold occurs at the wrong angle, place a C base to prevent an undesired A-U. If the fold is incorrect at this point, work from the natural fold view to interrupt undesired pairs by changing the bases in these regions, then fixup in the target view. 5.1: right after the strong G-C's at the neck of a hairpin. 5.2: between stronger pairs at the middle of a long zipper. The longer the zipper, the more weak G-U's it can hold without losing shape. 5.3: right BEFORE a zipper splits into a loop. Once desired shape is achieved, randomly swap out bases in loops to reduce loop energy, randomly flip base pair orientations to reduce energy, randomly swap out one base pair for another to reduce energy. Just want to highlight that there now is a more complete LIST OF GUIDES in the WIKI. Check it out. interesting... maybe it's because another cross-molecule connection is, thus, not possible, and therefore stabilizing this molecule? 1) Leaving a long set of A’s (I will label these as “stretches of desert”) untouched may result in desired shapes. Such deserts simply won’t bind well (except maybe to the few U’s strewn around). However, the overall score of all these molecules is in the lower midrange of all the submissions analyzed here. So, leaving a maximum of 5 A’s in a row is desirable, if not even less. 2)	Maximizing the energy difference between the states seems to result in higher scores, as the FMN seems to really bind well, even if the target shape does not coincide (even remotely) with the predetermined binding site. Ultimately, all lab submissions that were created using this strategy had a vastly different shape than the one required, but all score better than average, with a maximum of 80/100. 3)	However (and thus already limiting the last finding), high fold-change in Kd,obs alone also does not necessarily result in a good binding site. For high Tmelt=107 °C or higher, low resulting scores seem to be the norm. Another rule to maximize the score therefore seems to be to keep the melting point between 67 and 87 °C. 4)	Geometric arrangements of non-A’s (for example an A or a G every 3 bases, aranged regularly) seems to result in very low folding score and for some reason no differentiation between state energies. So, another conclusion seems to be to avoid regular arrangements of blocker (i.e. non-A) bases. Do not use mainly AUs or GCs. The way I see it is that both AUs and GCs are "strengthening" pairs and they shouldn't be used unless necessary. AUs are great basic strengthening pairs when the GCs are for the "heavy duty" use only. Fill your puzzle with GUs first, boost the loops and try to strengthen the structure with AUs first. Only if AU - GU combinations aren't strong enough you should start putting GCs in the game. Places where GCs are most likely necessary are in the edges of big / main bubbles and small bends where there is one A between two pairs. Best places for the AUs seem the be one pair off from start of the chain and / or in the middle of the chain (no always the case but usually yes). For example six pairs long combinations could look like this: "GU-AU-GU-GU-AU-GU" or if you need strong connections, "GC-GU-AU-AU-GU-GC". Sometimes chains need to be built only from AUs or GCs but they are usually very short chains or in some very tricky places. What seems also to make huge difference to the structure is that which way the pairs are placed. Flipping one or more chains might solve the puzzle without making any other changes to the puzzle. Flipping is usually the first thing I try before starting to place any GCs. Sometimes flipping long chains of GU pairs within the chain seems to also help and you might not need to use AUs or GCs at all. You should also always keep the energy levels visible as the energy levels help you to picture more easily why some parts of the puzzle won't work. Usually lower the number the better but not always. Sometimes higher numbers in the middle of the long chains or weakening of some parts might make other parts stronger solving the puzzle in best cases. With this approach I can solve most puzzles in less than 5 minutes including the harder ones and have great amounts of GUs at the end. I simply don't have so much success with AU only zipping or spamming the GCs. GCs also seem to have bad habit of messing the RNA structure which makes puzzle solving even more difficult. You should try this next time you play and check if it helps solving the puzzles. My method pretty much follows this and others, with one tweak. I start with all blue-yellow through the entire puzzle. If there are any 1-1 pairs, I turn them red at the same time, boosting all loops and bulges, and then begin to flip chain ends. As I go through the puzzle, I then remove unnecessary boosts. It is not needed to make the puzzle ALL white before starting to satisfy requirements. This works quickly for me 90% of the time in non-switch puzzles. It does not work well for switches! Worseize, thank you very much for your fine lab design tour! I think this video is going to be a great help also to newer lab players who are still wondering how to go about the lab and how to use different lab tools. Plus I always find it interesting seeing how others go about their lab work. I very much enjoyed this video and plan to watch it again. I'm curious about why you paint many of the nt's blue. BTW, your English and voice were great! Well done and thank you!